The last time I made this, it was in the inventing phase and I added the TVP in the day after to get the right balance of savory & sweet. This time I used whole wheat elbows and red onions, and it was super yummy! 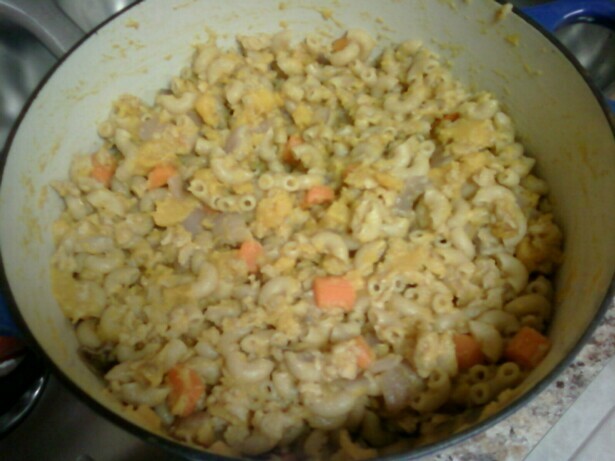 I used about 1/3 c. of nutritional yeast & roasted the veggies for a good 45 minutes, so the squash melted into the pasta. You can use whatever winter squash you’ve got around, but don’t forget to save & toast the seeds! here’s the link to my original recipe! !